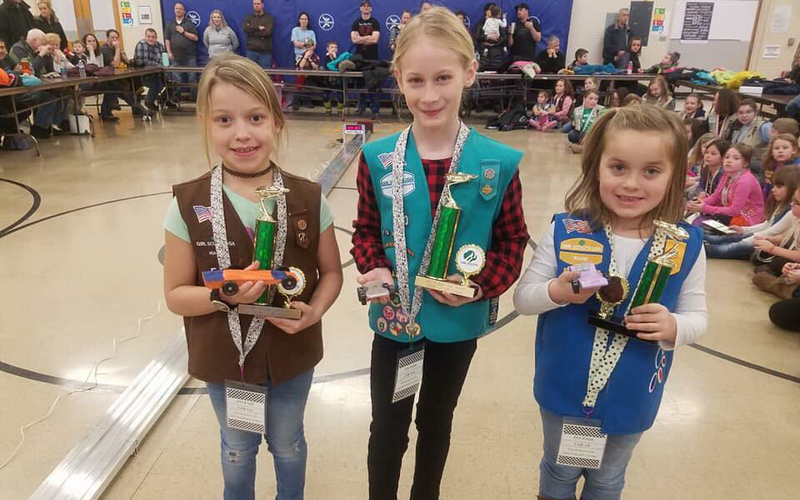 Just prior to the Cub Scout Troop 189 Pinewood Derby miniature race car competition, which took place on Saturday, Feb. 2 at Fort Kent Elementary School, local Girl Scouts held a similar competition of their own. FORT KENT, Maine — Just prior to the Cub Scout Troop 189 Pinewood Derby miniature race car competition, which took place on Saturday, Feb. 2 at Fort Kent Elementary School, local Girl Scouts held a similar competition of their own. 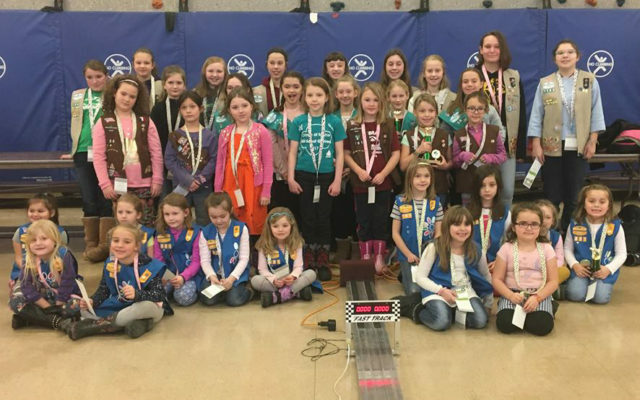 Members of the Girl Scout Emerald Unit, made up of 9 local troops ranging in age from Kindergarten to 8th grade built and decorated their own pinewood race cars for a “Not Your Brother’s Car Race,” during which 35 Girl Scout members from Daisies to Cadettes participated. Girl Scout Laurissa Roy designed the fastest car, followed by Peyton Devoe and McKenna Jandreau whose cars finished in second and third place respectively. The leaders who organized the races, Bettina Grange for the Cub Scouts and Jodi Jandreau Guy for the Girl Scouts, worked together to schedule the races on the same day and and at the same location so that both scouting groups could utilize the race track. Kate Lozier helped direct both races. “The Cubs are gracious to allow the girls to use their track every year,” said Girl Scout leader Jodi Guy. The girls and boys also worked together to achieve a larger goal than crossing the finish line on the day of the races. The Cubs kicked off a “Scouting For Food Drive,” to help bring in donations for the local food pantry, and were assisted by the Girl Scouts. “Girls brought in donations to help get them off with a bang as a thank you,” Guy said. Most Sporty, Lanie Pelletier; Most Colorful, Quinn St. Peter; Most Girl Scout Spirit, Micayla Ayers; Best Paint Job, Taylor Coulombe; Funniest, Nicole Daigle; Most Creative, Lilly Lozier; Most Sparkly, Olivia Ouellette; and Best Craftsmanship, Samantha Thomas.